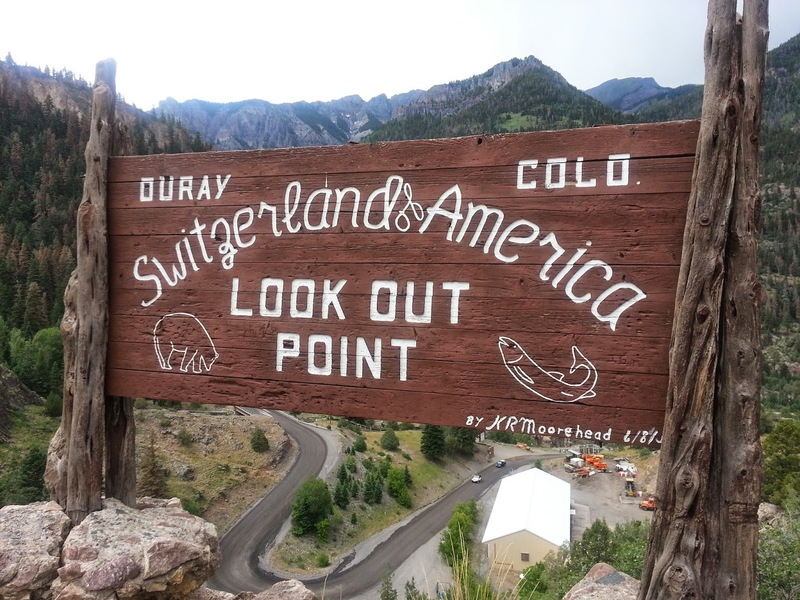 Ouray (pronounced U-Ray) is a small mountain town in Southwest Colorado that calls itself 'Switzerland of America.' Nestled in a river valley with waterfalls, surrounded by the snow-capped San Juan Mountains and famous for its natural hot springs, it is indeed a beautiful mountain town situated at 8,000 feet. We stopped here while driving along the San Juan Skyway to explore the town a bit and to have lunch. But we least bit expected what was going to happen next. Read on. It was July 4th and we reached the place around 1:30 PM. We parked the car and started walking along what looked the Main Street of the town. We saw a huge gathering at a distance and asked a passerby as to what is happening. She told us that an annual water hose fight that happens every year on July 4th is about to begin shortly. We were curious and joined the crowd to check it out. 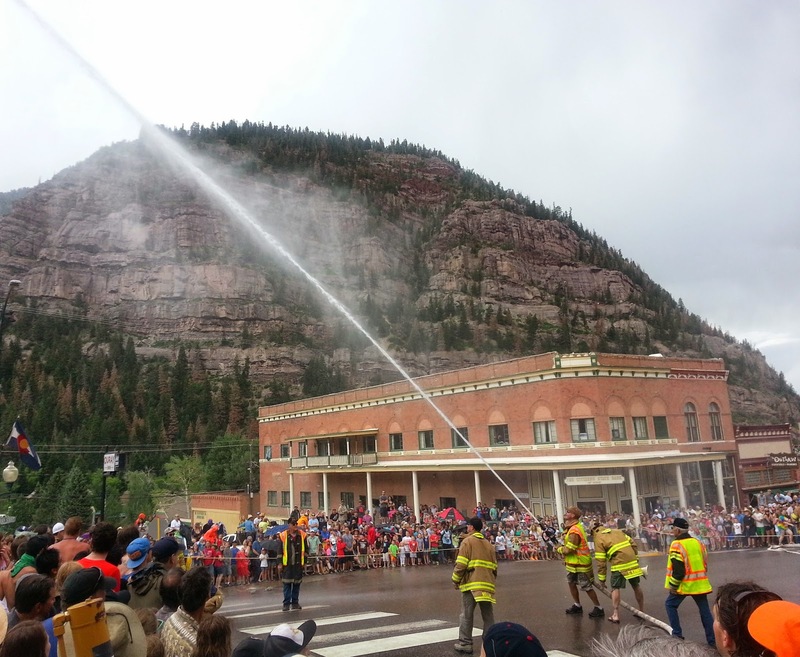 It began by engaging the audience with the water hose and drenching them. As water hit the crowds, they shouted with excitement. So did we. I love getting wet in rain, so I naturally enjoyed this. But I was pleasantly surprised to see such a large crowd voluntarily getting drenched in a public place. Spirit of the town, I say. The bouts began at 2 p.m. 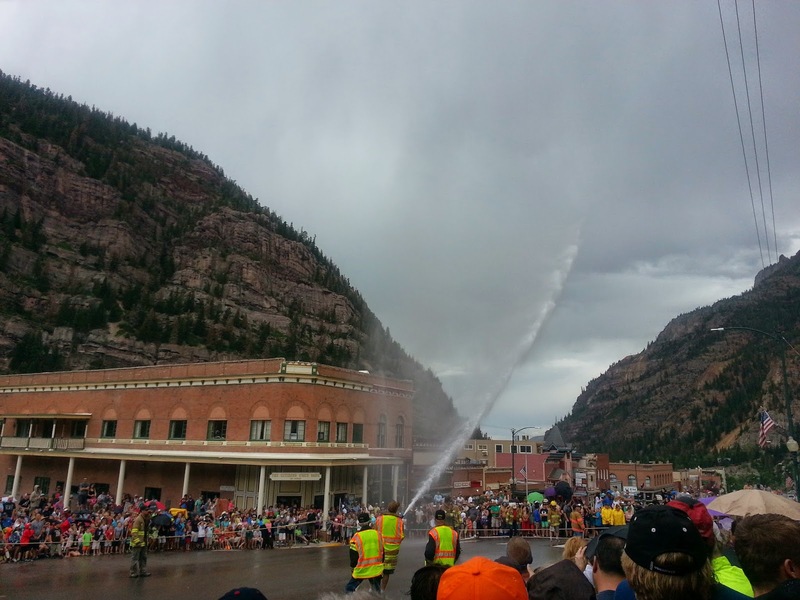 Teams of two blasted each other with streams of water from powerful fire hoses until one team or the other succumbed amidst the encouragement of the supporters. Whenever a team misses the target, the spectators on the opposite side get drenched and that led to more shouting and excitement. I stood there squealing with joy, supporting a team of strangers while waiting for the opposite team to miss the target so we could get wet. It was a huge drenching drama that I thoroughly enjoyed. It was my first time participating intimately in an American tradition and I loved the experience. We left the town after a yummy lunch at a Mexican restaurant but brought back great memories with us and a 45 second video of the water hose fight to share with you guys. 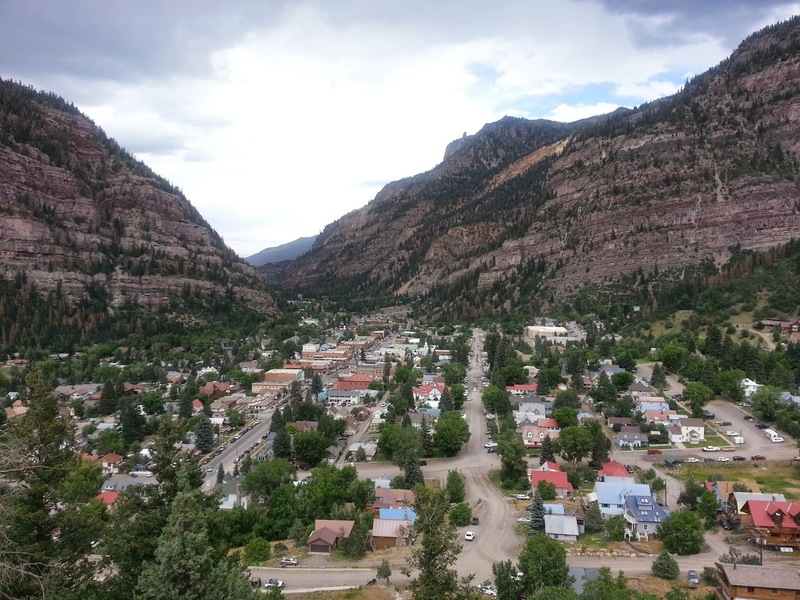 While I honestly think that comparing Ouray to Switzerland in its beauty is an overstretch, we had great fun in the town owing to their memorable traditions. Though I have not been to Switzerland yet (hope to get there someday soon), I can say the comparison is not fair from what I heard from friends who have been there and from the photos I have seen. I wish we had reserved some time to enjoy the hot springs, but I wasn't too keen to do it on a summer day. Hope to go back on a chilly winter day again to enjoy the hot springs amidst snow clad mountains.